Culture is guaranteed for purity and genera. Fungi can help teach many topics in ecology, genetics, biochemistry, and other disciplines. They are important decomposers, helping recycle organic materials in food webs, which makes them great subjects for ecological studies. Special packaging and transportation costs are extra. Mating strain of the common bread mold fungus. Will cross with item #156222A Rhizopus+ strain. 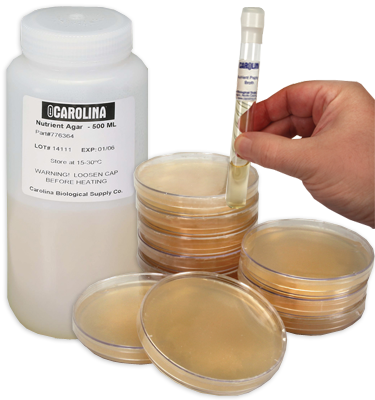 Culture on potato dextrose agar at 25° C.
MicroKwik Culture® is a Carolina trademark for freeze-dried, viable fungi with medium. Each culture comes with instructions for rehydration. Since MicroKwik Cultures can be stored under refrigeration, they can be ordered ahead of time for use on short notice. Note: Each MicroKwik Culture® comes with 5 mL of rehydration medium.